The Glens Falls Region has a wealth of wonderful places to propose. You can go down to Albany or Saratoga... or up into the Adirondacks! But why go so far when there are so many perfect proposal spots in Glens Falls? From the best modern art collection north of NYC to historic sites and picturesque bridges, Glens Falls has the romantic proposal spot you and your partner will never forget. With the water rushing by, Cooper's Cave is probably one of the most picturesque and romantic spots to propose in the City of Glens Falls proper. Take your sweetheart to this place where fiction meets history and add your own story to the history books! A popular wedding and engagement spot in the area, Crandall Park is perfect for an afternoon picnic and proposal by the pond. With three bridges connecting the islands in the pond, Crandall Park is a picturesque spot to propose and take engagement photos. If you're proposing during winter, where better than West Mountain? If you time it right, you can even take the lift to the top just in time for the golden hour and a sunset proposal at the top of a mountain! Then ski down to celebrate with friends and family at the lodge. The Hyde boasts one of the best art collections north of New York City. Take advantage of the museum's setting in a romantic mansion to propose in front of your partner's favorite painting or on one of the benches in the Hyde's beautiful garden. Hot air ballooning is very popular in and around Glens Falls. Every year hundreds of balloons are launched together at the annual Adirondack Balloon Festival in September, but you don't need to wait for September to schedule a romantic hot air balloon ride and proposal! See Warren and Washington Counties like you've never seen them before and propose while you're floating gracefully above your favorite landmarks. Take a cruise on one of the Lake George Steamboat Company's historic steamboats and propose in the middle of the Queen of American Lakes. With picturesque views and an incomparable setting, a steamboat proposal is one neither of you will ever forget. Did you know if you book it early enough, you can have an entire island to yourself in the middle of Lake George? This proposal is going to require some planning, but if you're dedicated, you can definitely arrange to be the only campsite on the island. 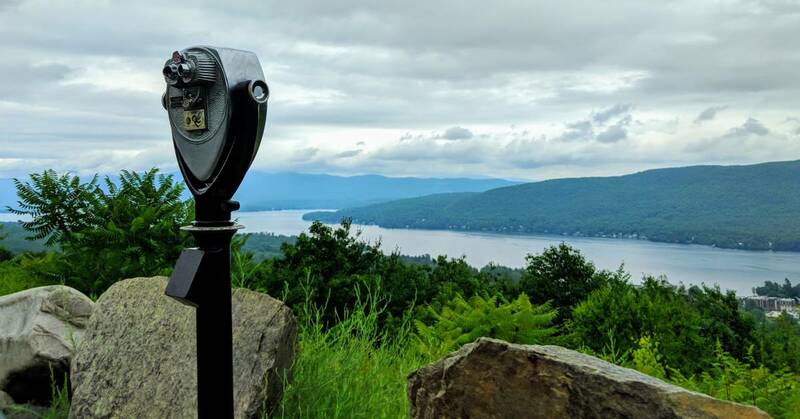 Prospect Mountain is one of the most popular hiking trails in Lake George, beginning on Smith Street in Lake George Village. The hike is 3 miles round trip and can be quite difficult at points. If you love the views but want to make sure you and your partner look picture perfect - and not sweaty - for the engagement photos, you can also drive to the top of Prospect Mountain on the Veterans Memorial Highway. At the top, you'll not only find spectacular views, but also the remnants of the Prospect Mountain Cable Incline Railway. Both the views and the historic railway make for insta-worthy photo backgrounds. The Comet at Six Flags Great Escape is an original wooden roller coaster and the ideal proposal spot for amusement park enthusiasts. If the two of you love roller coasters and having fun, Six Flags Great Escape is the perfect place to celebrate your engagement. Want more ideas? Find the perfect spot in Albany, Saratoga Springs, or the Adirondacks!